That Same Old Everyday Magic – Love. Life. Practice. There’s a lot of subjects I have in my Idea Farm that I’d like to develop. The problem is not one of scarcity, it’s of scope; several of the ideas have multiple facets to explore, certainly that fall into each of the three components of Love, Life and Practice. Think of a time you felt really wonderful. Seriously, I’m not going to sit here and try to string a lasso around ideas like “wonderful” and “magic.” What is magical for one person can be boring and mundane for someone else. I had a recent experience like that when a friend and I were at a performance. She looked at a juggler on the corner and saw him doing some fairly complex tricks with juggling clubs. “That’s incredible!” she breathed, entranced by the motion. I had not even looked at him yet; not because I don’t like juggling, but rather because I used to do it semi-professionally. And I looked at him a little more closely, watching the tricks he did, and I fell into a joke. How Many Jugglers Does It Take to Change a Lightbulb? Oh, I can do that. For me, it wasn’t magical; it was a simple practice of timing and muscle memory. For my friend, though, it was magical. How did I lose that? Did my familiarity breed the contempt? At what point did I start taking stalls and doubles and reverses for granted? If I went out and bought some clubs today, could I rediscover the magic that led me to want to do it in the first place? I remember why I did it, you understand: it was because then people looked at me the way my friend was looking at the juggler. I’m happy to say I did not actually voice the I can do that. That would have been a rather ungracious way to tarnish the wonder that my friend was feeling, and why would I want to spoil it? “Yeah, he’s pretty good,” I said, instead. Then, as he did a series of double behind-the-back throws, I let out a whistle. “Wow, that’s not easy…” My friend’s smile grew a bit wider. And just like that, I was able to share in the magic again with her. Sometimes it’s as simple as that. Being reminded by someone else’s reaction of what you found magical about something in the first place can help renew the wonder. Voyeuristic joy, or introduction by proxy, you can see something for the first time all over again. Will it be the same? Maybe. Probably not, I’d say. You have to notice that you have a different joy this time, though – the shared experience, and the advantage of all of the other things about the experience that you know but that the new person doesn’t. For example, this was a solitary juggler; if she’d seen the Mad 5 doing some of their juggling patterns, I think she would have been speechless. And I can tell you that some of the purest moments of joyful zen I’ve ever felt have been in the middle of one of those patterns, moving with the razor-sharp clubs flying at a zillion miles an hour millimeters from my delicate ears. OK, I exaggerate a bit. My ears aren’t actually that delicate. But you see what I mean? Watching the juggler didn’t do it for me, but just writing about a related experience has my hands itching to grip a club and toss it spinning high into the air to experience the miraculous fact that it always comes back down. Some people – myself included – have thought that understanding the How of something can reduce the magic. If familiarity does make you take something for granted, then perhaps if I understood the physics of juggling as well as Neil Degrasse Tyson, I would not be as enamored of it. I’m not so sure that’s true. I think that the “taking for granted” is something separate from knowledge. I know I disliked jazz until I learned enough music theory and practice to understand more of what was being done. And I bet Mr. Tyson would enjoy the jugglers just as much as my friend, perhaps more. Understanding a subject, a phenomenon, doesn’t automatically make it less magical. I can explain in great depth the neurochemical and psychological principles behind falling in love, for example, but it doesn’t make me any more immune to the right pretty face at the right time to make my heart go pitter pat. In fact, that’s kind of annoying. If knowledge is power, shouldn’t that make it easier to deal with phenomena like crushes and heartbreak and depression? Perhaps the answer is that while it gives you power, that power still needs to be exercised. It takes a conscious choice as to how you exercise it. 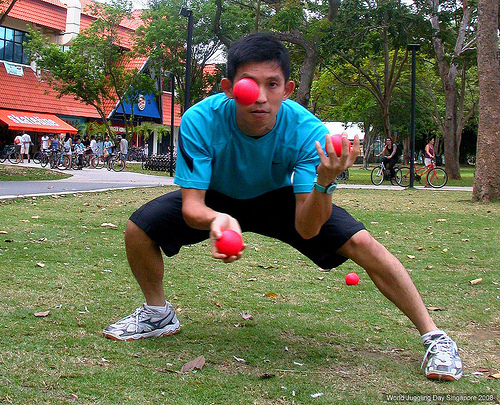 In the case of the juggler, the power of understanding his skills gave me the ability to dismiss it – it became less of a distraction. That power can be very useful if I were, say, driving, or watching my infant grandson (my toddler grandson, of course, would be equally entranced, and I’d finally get to start teaching him to juggle). However, by sharing the joy with my friend, I utilized the power a different way: I deepened the experience. I gave myself multiple layers to choose from – counting the rhythm of his pattern, say, or noting the width of the arc each club took as he caught it. I love listening to the ways jugglers deliver their patter, the verbage, the tone, the ways they interact with the crowd. Even if they’re bad, I am learning from that, or enjoying just how bad they can be and still entrance the occasional passerby. He hasn’t learned to use the power of his experience to dismiss things yet. I know it’s not possible, but I kind of wish he never would. I kind of wish he could just deepen his understanding of the world around him, and let the magic permeate his life completely. Because maybe then he could teach me how to do it, too. What if there’s a third option? Dismiss/Deepen/Empathize (granted, you lose a bit of alliteration). This might open up a little more of the knowledge-power to coping with things like heartbreak and depression. Rather than using the power to dismiss the feelings or feel them more deply, maybe the knowledge of the chemistry and sociology enables a little extra compassion for your self and the others involved. Hmmm…Empathy. Now there’s a direction I had not taken it in. Sort of a more active kind of voyeurism? I don’t mean that negatively, btw. It does seem to lead to more understanding, and I happen to believe that’s always a good thing. Thanks for the deep thought!